Google is holding a quiet “breakfast” this morning for some folks on the west coast and made a few notable announcements, including the release of Android 4.3 and a new Nexus 7. First things first as the company announced some notable sales figures as they surpassed over 50 billion apps downloaded through the Play Store. Revenues have increased more 2.5x per user with more than 1 million apps now filling the Play Store halls. As for the Android tablet market, that’s now increased to more than 70 million devices, 10% of which are the now old Nexus 7 model. As for the “new” Nexus 7, it adds a processor with that is 80 percent faster than its predecessor in the form of a 1.5GHz Snapdragon S4 Pro. RAM has doubled to 2GB as Dual-band Wi-Fi, Bluetooth 4.0 and 1920×1200 display now grace the device. The new Nexus 7 will work on Verizon, AT&T and T-Mobile LTE all in a single device powered by 9 hours of HD video or 10 hours of browsing battery life. The price will come in at $229 for the 16GB Wi-Fi model, $269 for the 32GB Wi-Fi model and $349 for the 32GB LTE model. Google believes that tablet sales will overtake PC sales by years end, so they are clearly going to put some marketing muscle behind the new Nexus 7 device. Availability begins July 30th. As for the changes themselves, there’s nothing earth-shattering but some nice new under-the-hood features that will make developers smile. New features include Multi-user restricted profiles which is great for families as it allows access to limited content. This will also make the Nexus 7 great for retail stores to use as a point-of-sale, but parental controls may be the best use case. Android 4.3 adds Bluetooth Low-Energy support, Open GL-ES 3.0 which adds much improved graphics for games, new DRM APIs, notification access which according to the official Android Blogspot “Your apps can now access and interact with the stream of status bar notifications as they are posted. You can display them in any way you want, including routing them to nearby Bluetooth devices, and you can update and dismiss notifications as needed.” Throw in easier text support, new languages and a new Netflix app with 1080p streaming that the new Nexus 7 is the first to support and there you have it, Android 4.3. OpenGL ES 3.0 — Game developers can now take advantage of OpenGL ES 3.0 and EGL extensions as standard features of Android, with access from either framework or native APIs. Bluetooth Smart — Now your apps can communicate with the many types of low-power Bluetooth Smart devices and sensors available today, to provide new features for fitness, medical, location, proximity, and more. Restricted profiles — Tablet owners can create restricted profiles to limit access to apps, for family, friends, kiosks, and more. Your app can offer various types of restrictions to let tablet owners control its capabilities in each profile. New media capabilities — A modular DRM framework enables media application developers to more easily integrate DRM into their own streaming protocols such as MPEG DASH. Apps can also access a built-in VP8 encoder from framework or native APIs for high-quality video capture. Notification access — Your apps can now access and interact with the stream of status bar notifications as they are posted. You can display them in any way you want, including routing them to nearby Bluetooth devices, and you can update and dismiss notifications as needed. Improved profiling tools — New tags in the Systrace tool and on-screen GPU profiling give you new ways to build great performance into your app. Developers can read all about the full Android 4.3 changes on the Android Developers blog linked below. so I take it, I won’t see 4.3 on exisiting OEM devices until 2014? got it. that is a real shame but unfortunately that truth!!!! What does the iPhone have that Android doesn’t have? but its a valid point. If you care that much about your android version, you have the ability to change it. You can’t blame Google for that. Blame the OEM for adding their own custom features to Android and then Blame your cell company for adding more on top of the OEM stuff. That’s a bit of an exaggeration. For instance, 4.1 was introduced last July & the Note 2 released with it in September. Hopefully, this means that the Note 3 will ship with 4.3.
hopefully the Note 2 will get 4.3 by the time when Note 3 ships? I really said it as an exaggeration to elicit another overaly exaggerated response, from you, really. lol. Welcome back, bro! Now that I doubt. That almost never happens. The Note 2 won’t get it until after the Note 3 debuts for sure. November or later is my guess. Probably not out of the question. At that price I would like 32gig and 64gig at 449. The 16gig will be 349 most likely. The way I see it you need to get an Iphone and join the flock. I think that’s what I need to do. New Nexus announcement are usually done by Fall. Key Lime Pie will probably be announced when a new Nexus phone is released. The vast majority of people here knew that. You really need to close the door on your way out, and never look back. All you ever do here is complain. Do yourself a favor and go be somewhere were you will be happy, and we all will be happy. lol Compete with iOS7 and IPHONE “5s”? What a joke. Thanks for giving a nice laugh today. Can my day get any better? As an iOS user, Android is still far more dynamic in the features and flexibility department. If you are gonna say anything negative about android, then talk about the instability according to device and how many apps installed. Ah yes! 4.3 for my note 3! If Wi-Fi calling became an Google play/ T-mobile Android App, then T-mobile can just have users buy the international version of Android devices and no one will need to wait too long for software updates. Nexus phones will also become attractive. The way Wi-Fi calling currently works makes it technically impossible to just be an “App” in the Play Store. It require custom low-level drivers and a custom Kernel to properly replicate phone/sms functions. That’s weird, because my old Mytouch 4G runs Cyanogen 10.1, running a custom kernel(Chronickernel) and sideloaded the WIFI calling APK, and it works just fine. They could do it but they don’t want to. That is the point, you need a custom kernel modules and proper pre-loaded drivers for it work. Samsung, HTC and others are not going to allow that kind of modification to their stock software. For most phones, the carriers dictate the final builds. You don’t understand what a customer kernel is from XDA. It’s not a T-mobile or manufacturer built. I do understand. The original comment was about releasing WiFi calling as an application in the Play store. I am telling you there is no reason for T-Mobile to release the APK in the Play store because it will not work on 99% of devices out there (devices that are not running a custom build or CM). The ROM doesn’t have anything to do with it. I actually did some more reading and T-mobile made it to where any of the newer phones(Spring 2012 or later) can’t use the WIFI calling apk any longer, but the older phones still can use the Kineto apk, because they built the phone to run that way. Now they put the wifi calling into the libs of the framework on purpose, to keep people from just installing an apk and using custom ROMs. Use Google Voice for a WiFi Calling app. i was wondering the same thing, but I think it’s viable since LTE is not fully covered yet…, but what band would the HSPA+ be? AWS or PCS? Yes, for t-mobile and ATT HSPA is supported. Verizon will just be LTE. 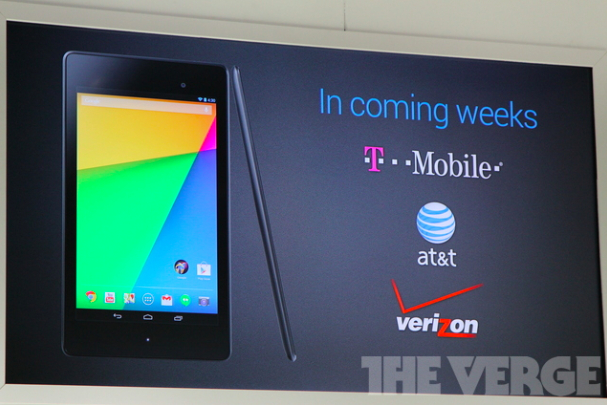 The Nexus 7 on T-mobile will have both HSPA PLUS and LTE ready to go out the box. I am actually looking forward to walking into my favorite Manhattan T0mobile store and purchasing both the Galaxy Note 3 and the LTE Nexus 7 tablet. Definitely a great way to end the 2013 year. yeah but the fact the device exsist I can only assume a company will at least try it in the US. With the new phablet phones this year pushing 6″ is a 7″ US phone in the next 18 months really hard to imagine. Anyone get the 4.3 update on a nexus 4 or Gnex yet? I have a nexus 4 with t mobile but haven’t received or den the update available for download. I’ve been checking often under system updates. I got it a few hours ago, but had to wait until I got home to connect to my wifi before I could install it. Nexus 4, running on T-Mobile but bought through the play store. does any one know when gs4 nexus version Google version will get the update. I don’t know about this, maybe it’s nothing. But do you notice the first or the top carrier on the picture is T-Mobile? I’m just saying. And 3 years ago, Samsung’s market share was that low. What do you have to say to that, fanboy? Blah blah blah blah same old same old pitiful 3g Sprint Galaxy Nexus from 2yrs ago. I mustsay you definitely the biggest waste of life ever. You makebeing broke pretty sad. 1. With just two words, I proved your entire ridiculous fanboy BS completely and horribly wrong. I think you need to look in a mirror when you say that “utterly sad” stuff. 2. Yet again, the great Richard Yarrell can come up with nothing better than childish insults instead of arguing based on facts or truths. How mature of you. I got my update today for Android 4.3 on Nexus 4. Will the unlocked Galaxy nexus get 4.3 or key lime pie? Guys think the Oppo Find 5 will get 4.3? ?